During orientation, your language proficiency in listening, speaking, reading, and writing will be assessed. Your class level will be determined based on your test scores. Reiko Akiyama couldn't be happier in Chico. A student in the American Language and Culture Institute, she came to the University to improve her English skills and develop her ability to teach. O Instituto Americano de Língua e Cultura, localizado no campus da California State University, Chico, oferece seis sessões de ensino intensivo de língua inglesa por ano, para estudantes estrangeiros de todos os níveis de proficiência, de iniciantes a avançados. Conditional admission is designed for undergraduates and graduate students who have not yet met the University’s English proficiency requirement. Students must apply for conditional admission by the University deadlines and submit all required documentation and fees. 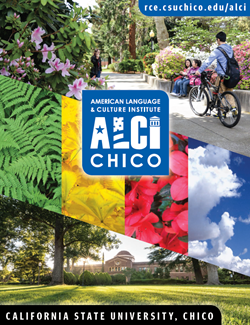 ALCI Chico maintains conditional admission arrangements with CSU, Chico and Butte College. We can also assist in transfers between other universities and colleges.